In 1995, international students made up 2.2 percent of the first-year class at Ohio State. In 2018, 13 years later, that percentage has jumped to 12.5 percent. This fall, 982 international first-year students have enrolled, a record high since the university began collecting data in 1945, according to the Ohio State’s Autumn Term 2018 Official Enrollment data. 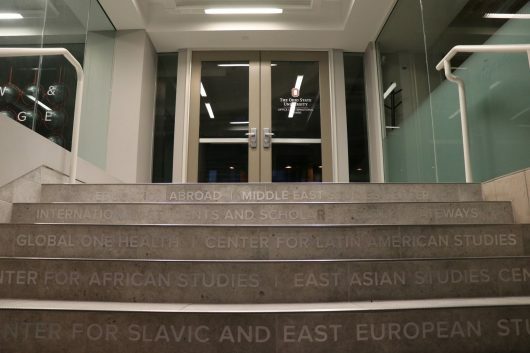 Ohio State’s historically high number comes at a time when, nationally speaking, international enrollment is falling. According to the National Foundation for American Policy, international enrollment in the United States fell 4 percent between 2016 and 2017. That drop is expected to double this year, while universities in other countries project double-digit increases in enrollment, according to the National Association of Foreign Student Advisers. The decline in international enrollment hit Ohio State as well; in 2017, Enrollment Services reported 588 first-year international students, a 31 percent decrease from 2016. In response to falling international enrollment, Ohio State has developed programs for both professors and students to attract more international students to the university. Yiwei Shen, a first-year from Shanghai, China, studying political science, is one such international student. Shen is currently in the John Glenn Civic Leadership Learning Community, and said having a community of peers with him from the beginning of the year has helped make the transition into college a smooth one. Shen said, however, the biggest challenge he’s faced is the language barrier, which is prevalent in his coursework. “Political science classes usually require a large number of readings, which [has made] me feel really uncomfortable in the first several weeks,” he said. Despite the language barrier, the readings, which also can be difficult for native English speakers to understand, have not discouraged Shen. “I’m glad to accept these challenges to push me away from my comfort zone,” he said. International students often struggle culturally when transitioning to college life in the United States, and that can have severe impacts on mental health. According to a 2013 Yale Study, 45.5 percent of Chinese international students experience mild to severe depression while studying abroad. Aside from the language barrier, students report academics and social isolation as contributing to distress. Melissa Beers, program director for Introduction to Psychology, said there are various opportunities at Ohio State to help make the transition for international students as smooth as possible. In the Culture Ambassador for Resident Enrichment program, for example, domestic students in each residence hall act as representatives for international students, providing a social safety net. The Consultation and Counseling Service provides services in multiple languages to accommodate foreign students. Before students arrive on campus, Ohio State works to ensure a more comfortable transition through programs like a pre-departure orientation session in China as well as an airport welcome program. International students have proved beneficial to classrooms in the United States. International tuition is often used to supplement scholarships for domestic students, meaning that universities become more affordable for American students. Further, international students provide what some view as a crucial component to a successful university: diversity. For Beers, the importance of diversity lies in interpersonal connections. She likes how interacting with people who come from around the world has become a part of the university experience. “You’re exposed to people who have different viewpoints [and] different cultural backgrounds in a way you [wouldn’t] if you didn’t come to the university,” Beers said. Professors periodically undergo training to help them learn how to eliminate cultural bias in their classroom, which has historically impacted international students pursuing degrees in the STEM field, according to Beers. “One of the things that we’re constantly concerned about is making sure that we’re not introducing cultural bias into our classes” Beers said. Still, Beers believes there’s room for improvement. For Shen, the freedom that comes with attending an American university outweighs any challenge he might face. Congrats to OSU because being an international student away from home is difficult, compounded by our complex culture and language problems. Welcoming and assimilation assistance must come from numerous sources, including the White House, to aid these young people embarking on life’s journey. Most struggle in their efforts and need guidance from schools’ international departments, immigration protection, host families, concerned neighbors and fellow students, and even informative books to extend a cultural helping hand.